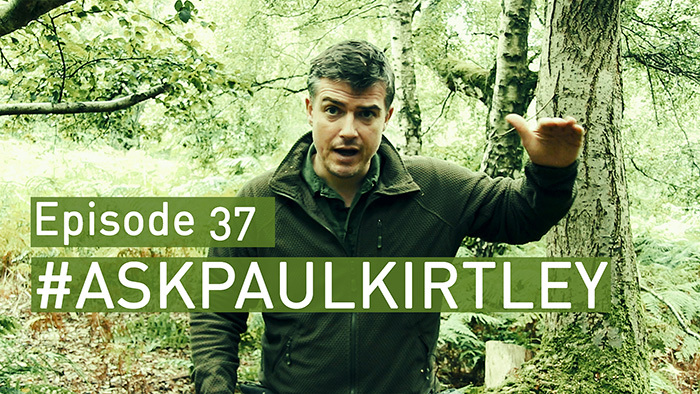 In this episode of #AskPaulKirtley I answer questions about shelter bedding, sustainable birch bark harvesting, martial arts and teaching bushcraft, higher or lower for optimal camp temperatures, cod liver oil tablets for survival packs, at what weight is a tent too heavy, career advice for someone who wants to work outdoors and what’s best – tarp or tent? Great as always Paul, I always enjoy these shows and learn so much, it adds wonderfully to both my Tree Plant ID course and Elementary course. I can’t thank you enough, you have given me all I could have asked for and have taken my knowledge from a very limited and restricted position, to one that really encompasses a vast array of skills and knowledge, I am truly grateful. My ears perked up at the end there hearing my name! Great to hear you have included it into your pod casts, hopefully more bushcraft related questions will arise through the implementation of skills and your students’ difficulty in achieving an end result. It goes without saying, i have learnt so much about the skill and how different woods change technique, importance of dimensions, pressure, speed, insulation, ground conductivity, tinder preparation, mental attitude, belief how to accept failure and to come and overcome it and much much more. As you know I throw myself 100% into learning new skills and this is no acceptation! Now coming into spring, the beautiful wild flowers are out and I am really focusing on plant ID (and as you said, I’m posting pictures on insta all the time). Once again, without your teachings I would be miles behind in my implementation here. Family traits are so important and are global hence why i spend 30 mins + 7 days a week religiously studying. I can now say I can recite and remember word for word the whole of up to module 4. Trees, their identification, plants and theirs, family, their common name and botanical name, their appearance, texture etc etc etc etc. I am also focusing on carving now the days are getting longer and warmer. I am doing both intricate ornamental carvings and functional carvings from different woods (all on insta). This not only strengthens my experience with knife skills, techniques, visualising and procuring 3d objects, but also keeps my sharping skills top notch too! I have said a lot, but since to moving to Australia and having so much more space and opportunity to be alone in the wild, my practical implementation of skills has drastically increased, that and the wonderful warm days. Thank you again, you have been pivotal In my studies. If only others are lucky enough to learn as much as i have so far, and continue to do so. It’s good to hear from you here on my blog. Great post – you illustrate what is possible when someone applies themselves to learning. What you state with regards to bow drill is an excellent example of what I was alluding to with my answer to the question about martial arts, when I was talking about repetition. You’ve told me in the past how much you are learning from my materials and again, you are a great example of how this process works at a distance. Your current location in Australia means it would be hard for you to be further away from me while still being on Earth and yet you are still learning from me. That said, the real learning, taking ownership of the skills and making them your own comes from practise and reflection. last me till the spring . Good to hear from you again. Glad you liked this one too. Sounds like you’ll have plenty to be keeping occupied with (and some beverages for the dark winter nights 🙂 ). In answer to your question, I’ve just finished carving a spoon and spatula that have come out perfectly for the first time, which I am massively proud of they were so good my camp mates genuinely thought I’d bought them aha! I’m also going to be looking at finding a good underquilt to tackle convection in my hammock for this winter, will hopefully be able to afford it before the Spey trip! It’s always good to hear from you. I’m pleased you found this episode helpful psychologically. Working on skills is always worthwhile and carving is one of those things which takes time or, at least, multiple repetitions (up to you how many reps you do in a given time period). Glad to read you are getting good results now. Whatever happens, it’ll be a good trip. I’m very much looking forward to our journey and catching up. Great video as ever Paul. Skill wise at this time of year I like to practise various fire-lighting skills (friction, Flint & Steel etc.) as i think these are essential things to practise and also things can be a bit more challenging due to the damper weather we get here on the UK. It’s always good to hear what you are up to and yes, I’ve been following your photos on Facebook. A love of autumn, fruits, fungi and combining wanderings with photography all resonate with me, as does testing one’s skills vs colder, damper conditions. Good to hear from you as always. I see from your Instagram feed you have been seeking out fungi and trying to ID them. I’m also waiting for some colder nights to test out some autumn/winter sleeping gear combinations – it’s been way too warm recently! Let me know how you get on with sleeping out once it cools off a bit. First and foremost thank you for sharing your knowledge. I normally watch on youtube but I wanted to answer your question about fall activities and plans more directly. Since I live near the Mississippi river in Tennessee I don’t get much time in the summer to be outdoors as much as I would like due to the excessive heat and humidity. I work in the heat and tend to avoid in when not at work. I am planning to be in the woods a good bit more now that the weather is starting to cool somewhat and work more on general skills building toward a few winter camps once the temp really drops. Specifically in the area of tarps and fires in the 30’s F range. Hi Paul, another good post. I seam to have developed a fondness for spoon carving and plan on extending those skills. Also I am working on my axe skills, trying to get some distance from my over reliance on my kukri. Beyond that it is just getting outside. Just returned from a great week in the Trossachs, watching the rapid change in the colour of the bracken.